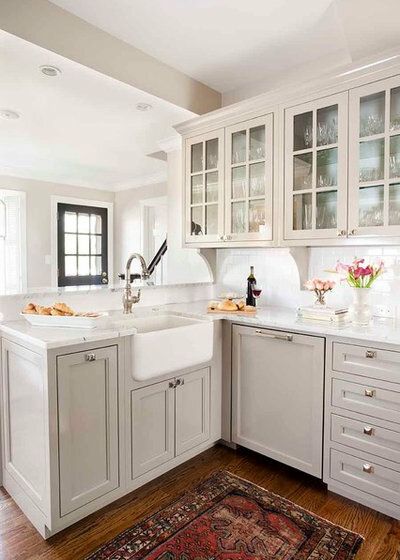 Whether you’re planning a new kitchen from scratch, remodeling what’s already there or just looking for ideas to improve a space you aren’t in a position to change, these 99 ideas should provide plenty of inspiration. 1. Look up. Vertical paneling — or vertical tile grout lines or wallpaper patterns — can trick the eye into seeing a far taller space than is really there. Here, long handles echo and enhance the effect. 2. Introduce a teeny table. 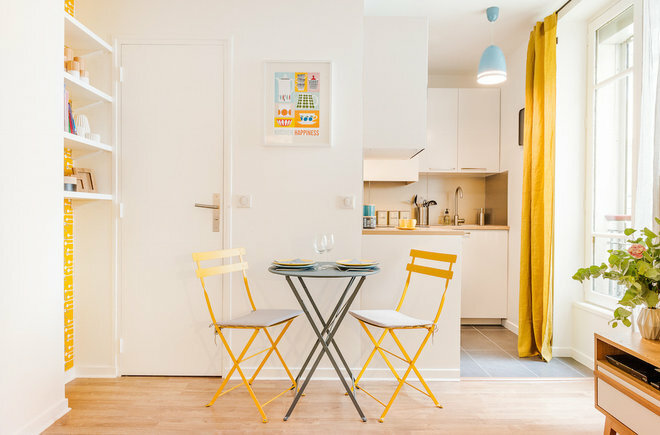 You may not have the space for a roomy dining table, but could you squeeze in an airy perch for one or a bijou lunch location for two? Go for something round and pick table and chair designs that block the least amount of light to increase the sense of space. 3. Stick to three colors. 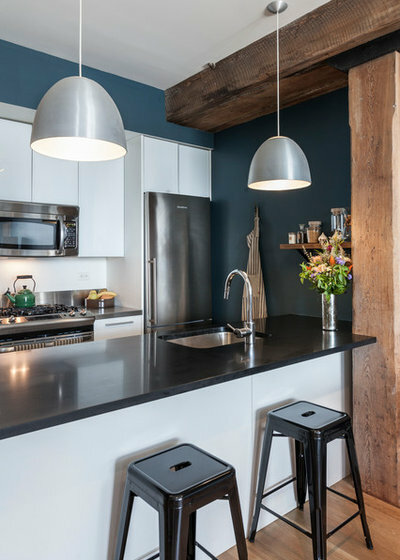 A strict palette will help your little kitchen look pulled together, streamlined and well-ordered. 4. Break architectural conventions. It would be easy to look at this large window, with its frame almost touching the back wall, and write off the sliver of vertical space next to it. But look how much storage a little design bravery got these homeowners — and the window is none the worse for hosting the handsome shelves. 5. Enhance with an accent. With its blurred lines, a one-hue space will certainly appear bigger, but if that leaves you yearning for color, get it in with a bold accent. Keep lines slim so it flashes rather than dominates. 6. Reflect beauty. 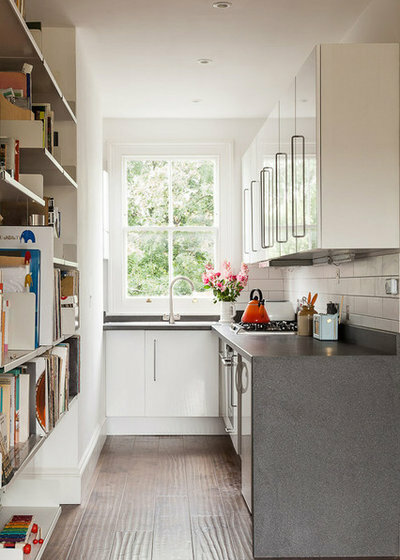 Hurray for glass-fronted cupboards and their light-bouncing, space-enhancing ways! Add glossy wall tiles and you’ll double the effect. 7. Go luxe. A luxury touch will give your small kitchen grandeur beyond its dimensions. And it doesn’t have to cost the world. This marble-looking backsplash is, in fact, porcelain tile. 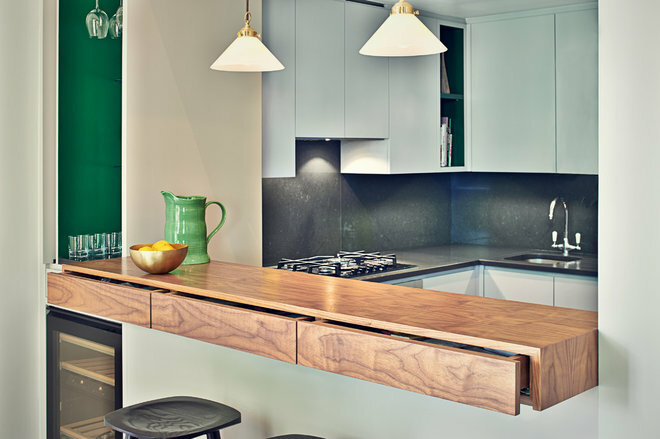 Add an on-trend, burnished brass tap to take the idea further still. 8. Put windows to work. 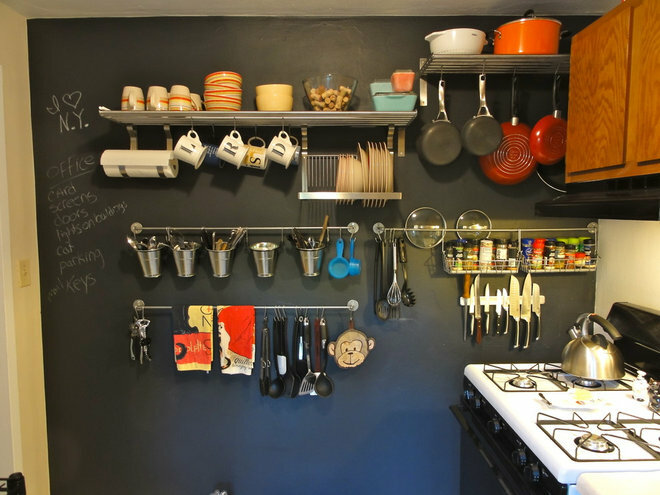 No wall space for a pot-hanging rack? If you have a wooden sash window, then, with a few nails or screw-in hooks, you’ve found that missing space. 9. Pause before you box in. Is that a wall of dead space next to the oven or the opportunity for a nifty niche? Ditto the open shelves on the outside of the peninsula. 10. Think outside the drawer. 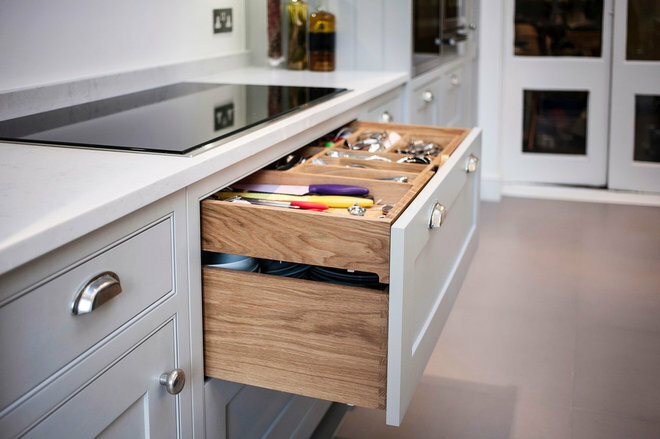 A cutlery drawer may be a luxury you can’t justify in a teeny kitchen. If so, look at other options. 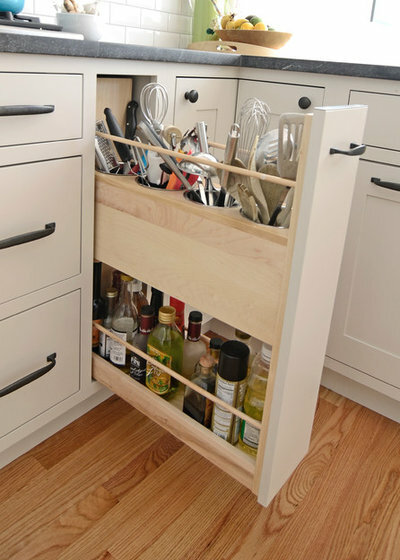 This clever pullout storage for utensils makes use of a slim gap between cabinets. 11. Turn on the heavy metal. Similar to glass or mirrors on a wall, metallics bounce light around and add the sort of larger-than-life glamour one might not expect in such compact surroundings. 12. Incorporate ends. 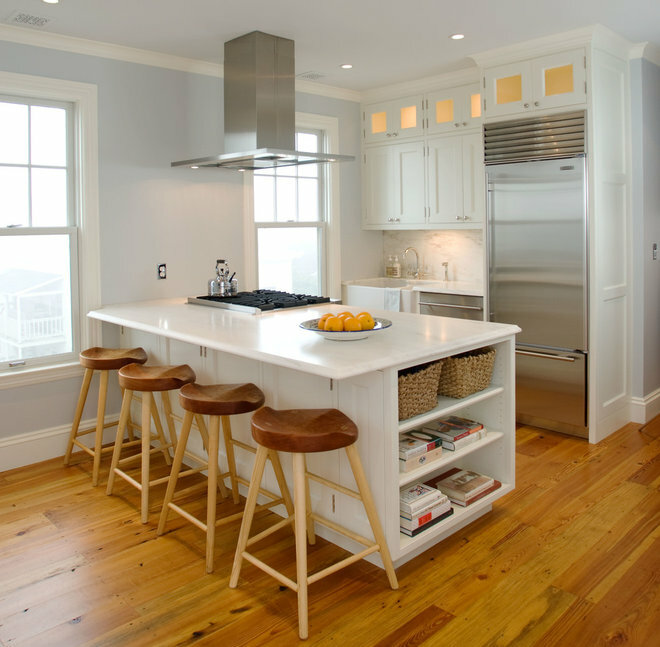 The end of an island, a peninsula (seen here) or even a run of cabinets can be put to use. 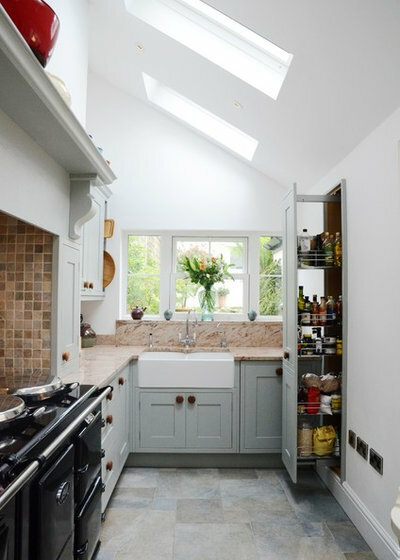 If there’s space inside, build in shelves for kitchen clutter (hidden in attractive baskets, of course) and recipe books. Use wall space for hooks or a rail to hang tea towels, pots, pans, utensils or even reading material. 13. Divide and conquer. In an open-plan kitchen-living space, the risk is that you’ll spend long evenings gazing at the dishes you aren’t intending to wash until morning. Hide them away with a raised wall behind your countertop. It’ll double as a backsplash too (especially good when there’s a sofa directly below on the other side). 14. Install a slim island. No room for a full-size island? A butcher’s block could be the answer. 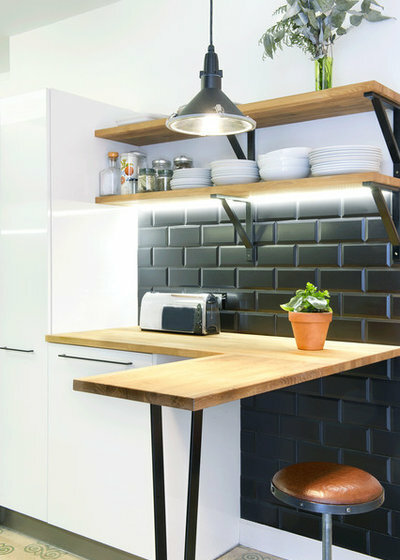 It might not quite provide the breakfast bar of your dreams, but it’s a rustically stylish way to introduce some invaluable extra workspace into a compact kitchen. 15. Slide into a wall. 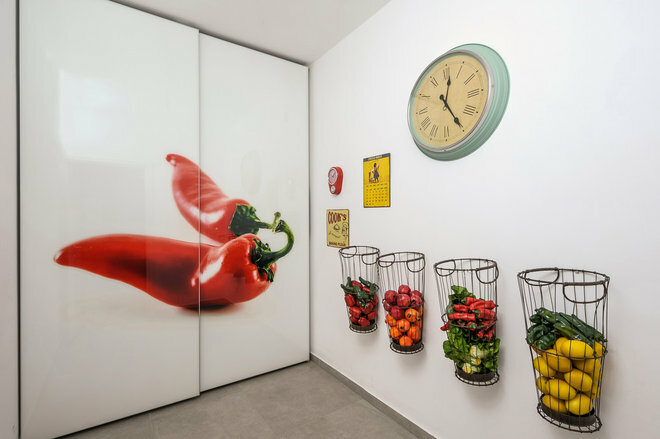 If you have dead space on the other side of your kitchen wall, make use of it with a beautiful pullout pantry cabinet like this. 16. Build in corner storage. 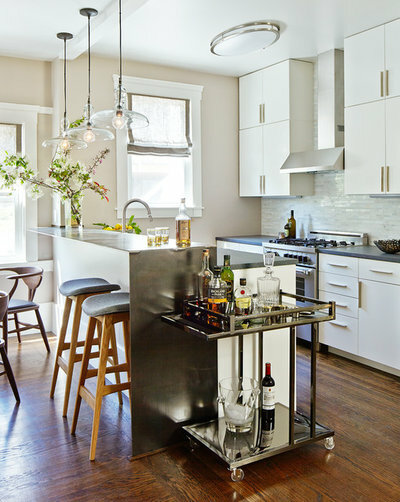 An extra-wide countertop has created a useful peninsula — and allowed space for open shelves. The shallow spot at the end of this peninsula is just the right depth for glasses and paperbacks. 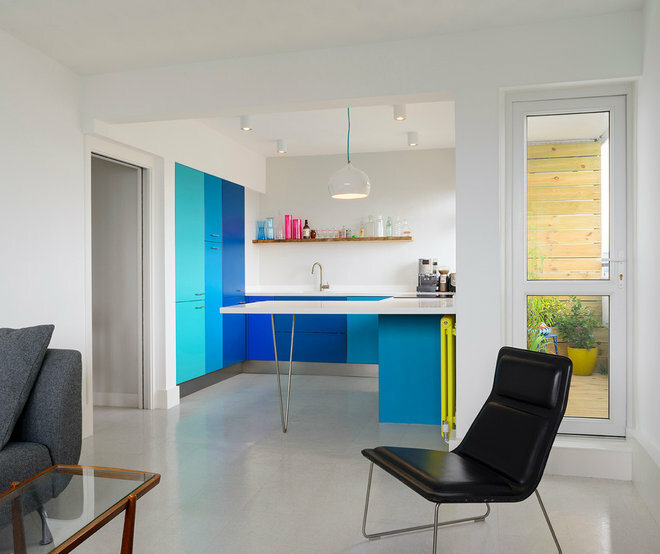 Painting the storage in an open-plan kitchen-living space, as seen here, can help tie the two zones together. 17. Love your wall space. More drawer or cabinet space isn’t always the answer. With just a half-day of DIY and a collection of rails, hooks, pots, baskets, magnets and racks, a blank wall can be transformed into a storage powerhouse. A painted pegboard is a good multifunctional alternative. 18. Pull it out. Tight on prep space? 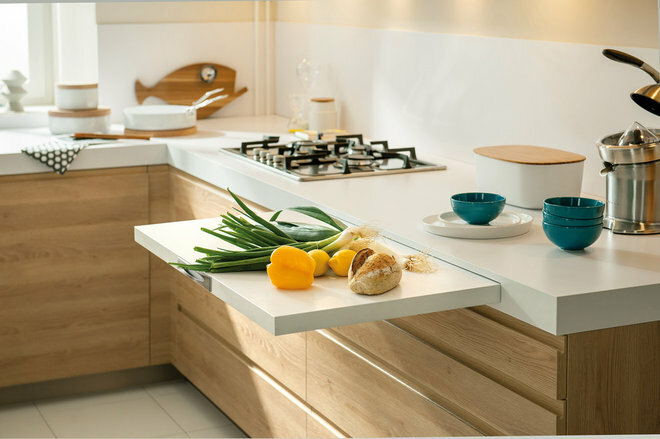 This pullout chopping board is a custom worktop solution, but you could also consider a false top drawer that slides out to reveal a board. Or, if you’re handy and resourceful, you could install a ready-made board by mounting it on drawer runners. 19. Frame it. 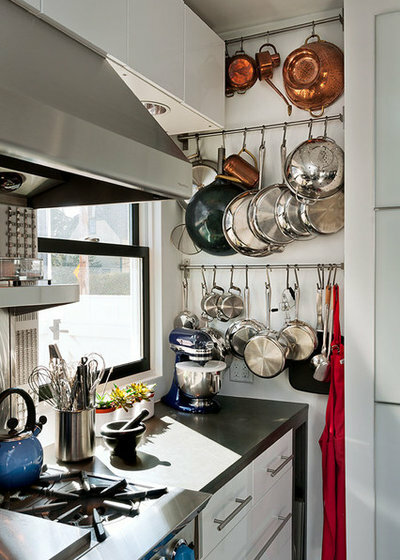 Just as pans can be hung successfully across the middle of a window, shelves can be erected there as well. Continuing them out along a wide expanse of wall, as here, stops them from looking fragmented (and packs in even more storage). 20. Put it in a cabinet. 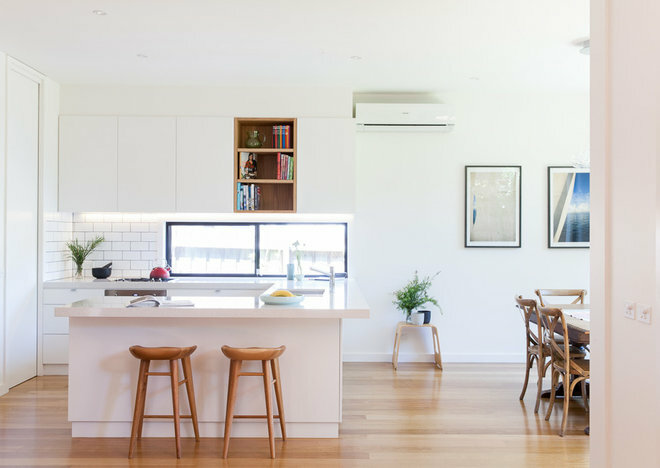 To keep a compact kitchen-living space feeling like somewhere you can relax when the cooking’s over, a one-wall layout, tucked behind folding doors, is a winner. 21. Merge your countertop and kitchen table. A movable table could easily do the trick too, but the sleek flow of a connected surface works well. It’s another custom solution but one that really increases the streamlined sense of this small space. 22. Build in a bench. You can opt for a tailored unit such as this one. Or if your budget is tight and you like an eclectic-utilitarian look, try buffing up and trimming some old scaffolding boards and perching them across sturdy plastic crates in a color that works with your design. Add height — and softness — with stylishly covered bedroom pillows or long cushions. 23. Tuck in a big table. 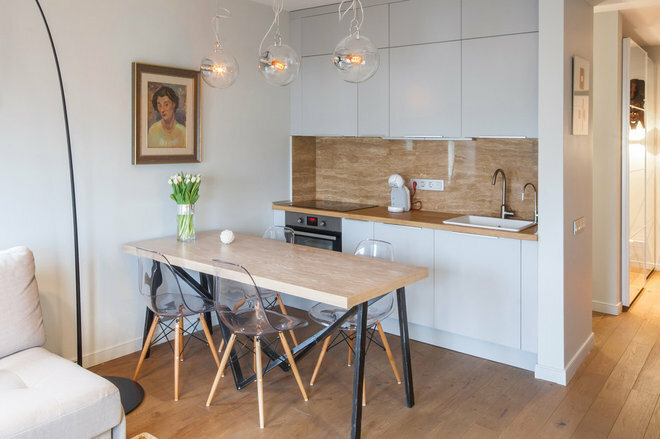 A generously proportioned kitchen table is a big-room luxury, right? Not necessarily. 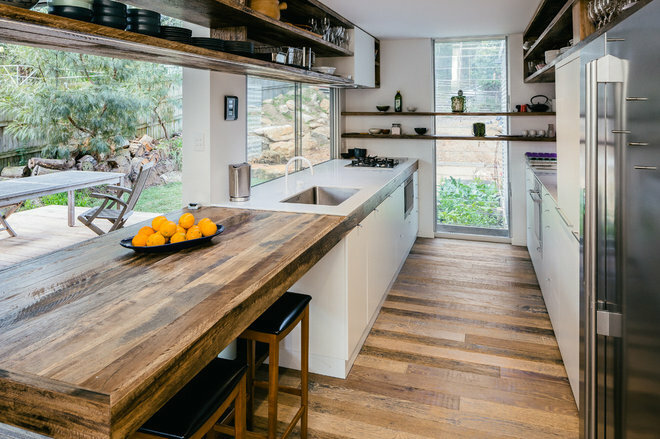 This table could have been considered too large for this under-the-eaves cook space, but because there are only chairs on the ends, there’s enough room to use the one-wall kitchen. 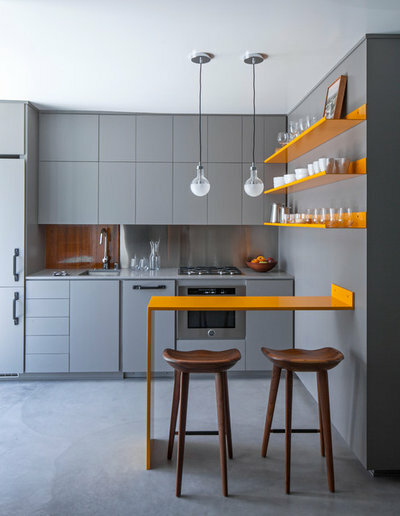 You could either tuck stools underneath to pull out for extra dinner guests, or hang a pair of attractive folding chairs on a nearby patch of empty wall. 24. Scale down appliances. This wee New York studio apartment turns convention on its head with half-size appliances cleverly positioned. 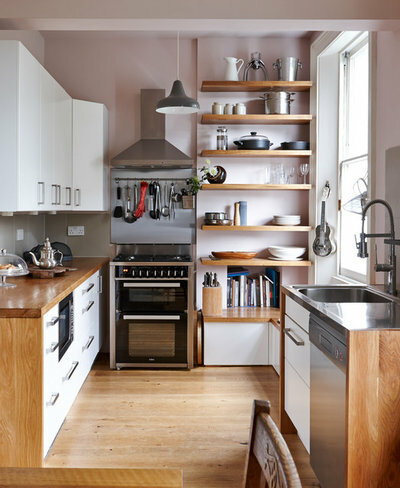 Seek out small versions of everything you’ll need, and ask your kitchen designer for advice on smart ways to fit them in. 25. Try a bar cart. Wine bottles cluttering up your countertop? Turn them into a feature by adding a bar cart if you have a sliver of unused space. Look for compact designs, and consider using the bottom part of the cart to store something different. 26. Feel free. This portable gas cylinder stove, mounted on a professional-style stainless-steel cart, is perfect for spaces that need to remain flexible. 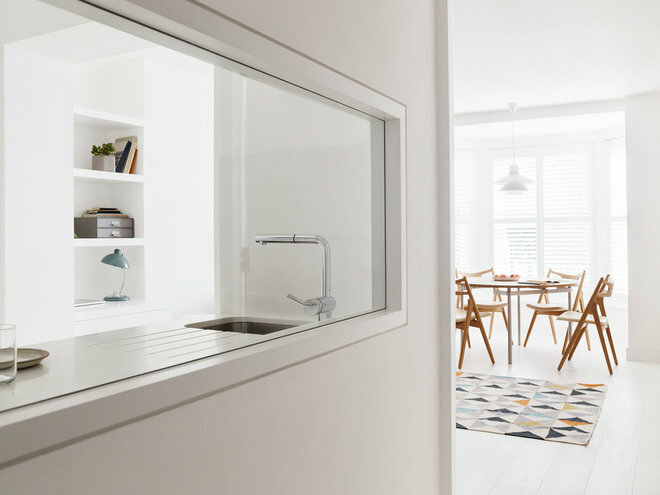 This utilitarian set-up in a New Zealand home could conveniently be wheeled out of the way to make space for a fold-out occasional dining table, for example. Do check building codes and consult a pro before installing any gas-powered appliance. 27. Smooth out lines. 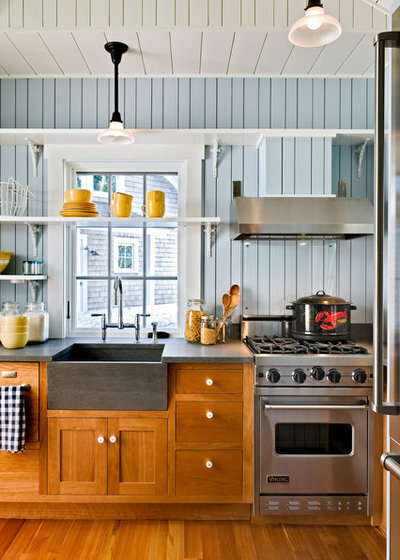 Minimize horizontal lines to visually stretch your little kitchen vertically. 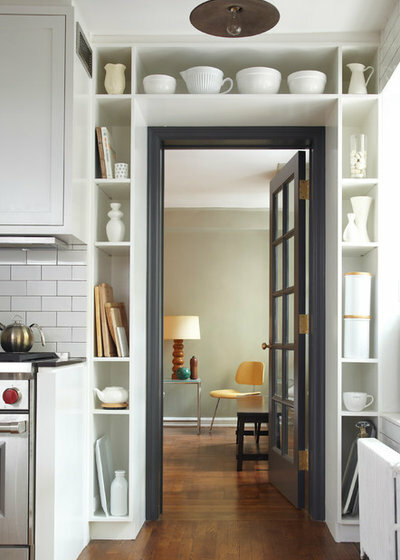 If you’re starting from scratch, consider hiding drawers and daily clutter behind two smooth, tall, painted doors. 28. Go for a whiteout. 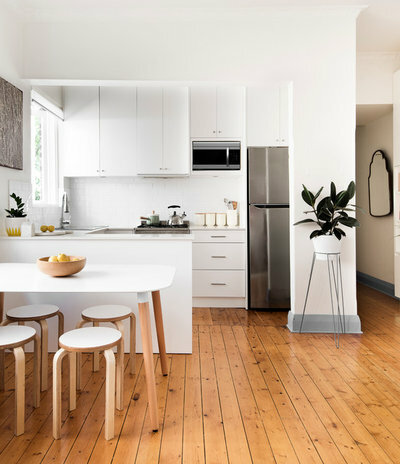 When you don’t want your kitchen to dominate your open-plan space, giving it the all-white treatment will help it “vanish” into the background. 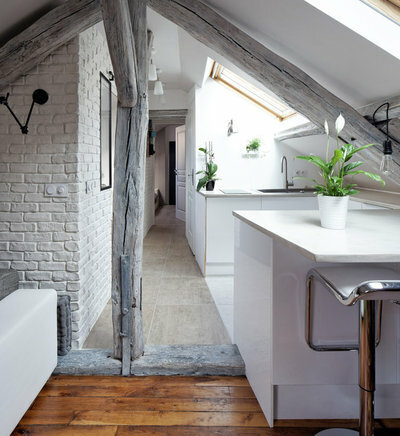 Thin-plank, light-bouncing polished wooden boards running lengthwise stretch the room generally, while also adding warmth — and a dash of Scandinavian chic. 29. Set it back. 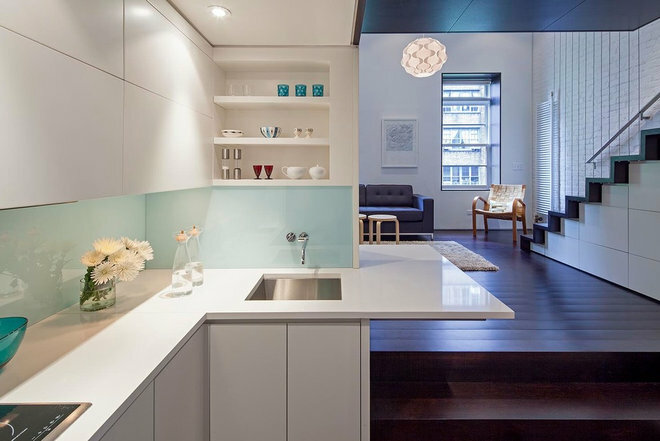 This slickly designed small kitchen feels spacious because of the clever placement of the cabinets. White walls and pale flooring help the base cabinets melt into the background, while the dark tiling above creates depth. Setting the tall, wood-fronted wall cabinets into the recess keeps them from intruding into the space. 30. Keep lighting low. 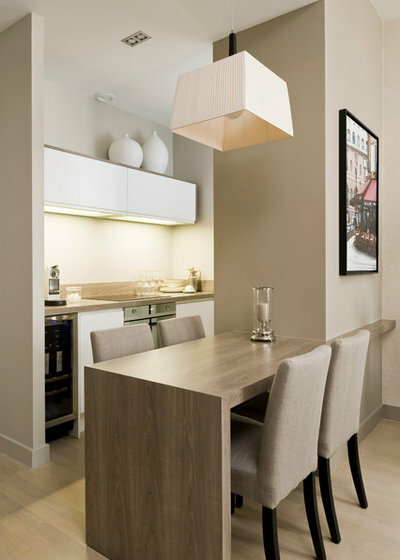 A table lamp is always a cozy touch for a kitchen countertop, but there isn’t always space. Check out this cool alternative: a low-slung bare filament bulb over the breakfast nook. 31. Hang it all. It’s not only utensils, pans, spices and tea towels that can work with wall-hung storage. 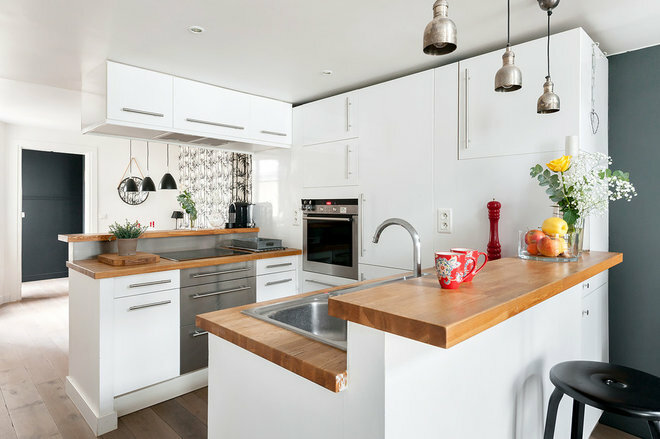 A lack of workspace is often the most noticeable thing in a small kitchen, so forget having fruit or vegetable bowls cluttering up your countertop. Instead, use wall-hung baskets. Think, too, about other ways of freeing up that work surface. Could the radio go on a shelf? Will the toaster fit inside a drawer when not in use? And if you’re not spiralizing your vegetables and fruits daily, hide that gadget in a cupboard. 32. Let it flow. 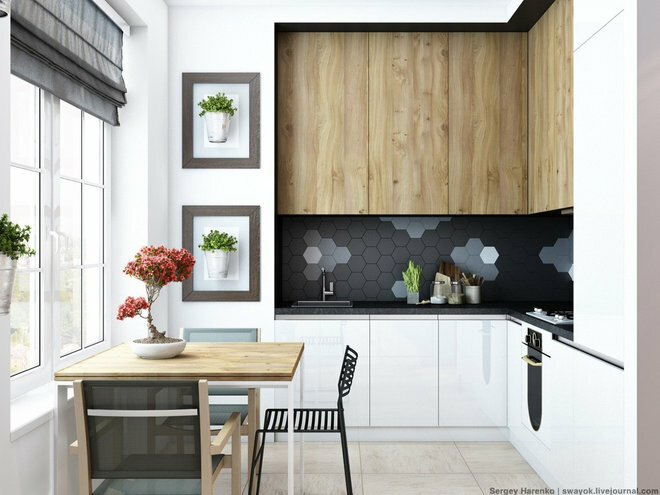 When a kitchen is as closely connected to a sitting room as this one is, take as much care with the decor and accessorizing as you would in the living space. Artwork, glamorous lighting, complementary colors and flooring that flows seamlessly will all help the rooms work with, rather than against, one another. 33. Multitask. Is it a countertop or a breakfast bar? Brilliantly, it’s both. Also note the stylish overhead pendant, adding gravitas to this tiny dining spot. 34. Nab a niche. Recessed shelving — in a wall niche, as seen here — is the friend of many a small space, as it removes bulky protrusions from your limited work area. The curved end cabinet on the right also gives an impression of increased space, rather than chopping it up with sharp corners. 35. Ramp up coziness. Characterful wall lamps, rather than overhead spots, create soft pools of light that ramp up the cozy feel of a small space. Choose adjustable versions so they double as task lighting. 36. Never say never to an island. You may not have the space for a conventional island, but this tiny custom unit adds plenty of practicality to this compact kitchen. 37. Get around. A circular table can save space in a compact kitchen. Curved end units may also be worth considering; corners, whether on tables or countertops and cabinets, can interrupt the flow of a small room. 38. Use deception. Extend your wall storage by adding shelving to fill a non-standard-size gap at the end of a run of wall cabinets. 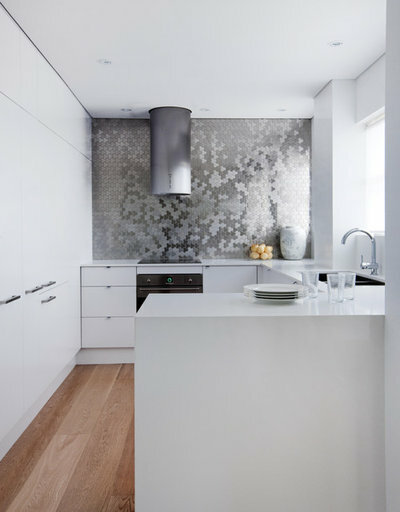 But don’t let it create visual clutter in an already packed kitchen. 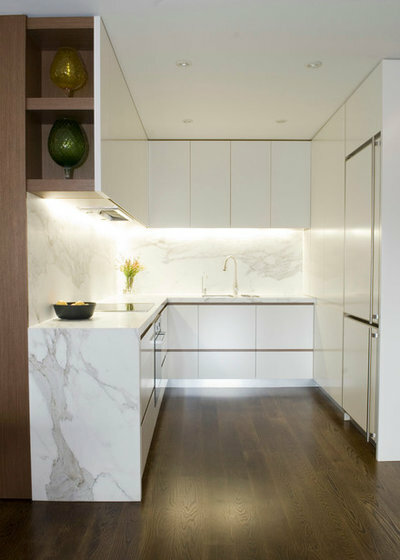 Instead add a panel at the front that matches your cabinets — effectively, a false cabinet door — and the streamlined effect of your sleek wall units will continue, as seen here. The same idea also will work for base cabinets. 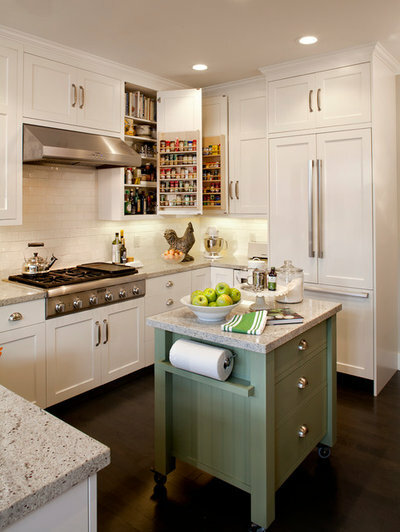 If your cabinetmaker is game, you could turn the open shelving into concealed storage instead. This would depend on the panel sizes available and your door front material (cutting laminates can result in messy edges). So get professional advice on what may be possible. 39. Carve out a cube. 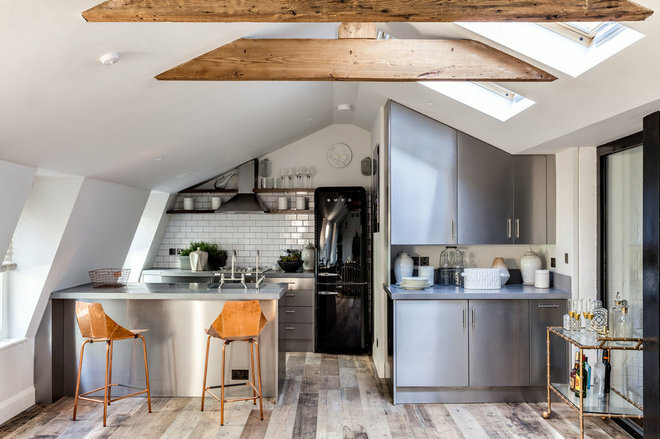 Even in an open-plan room smaller than this one, there’s no need to tuck your kitchen into a corner. 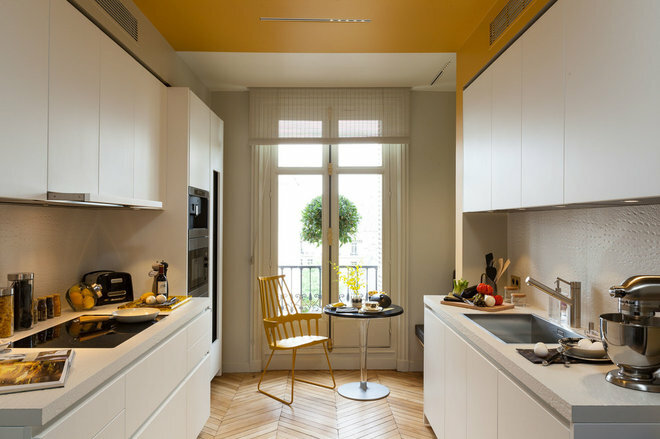 You might gain more space by creating a stand-alone open box for it, in the center of your living space, as seen in this Paris space. 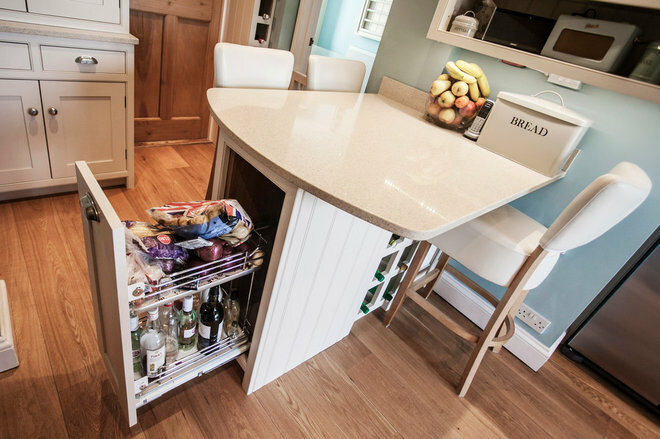 With clever planning, it could create more storage, and become a more sociable spot. 40. Go round the bend. 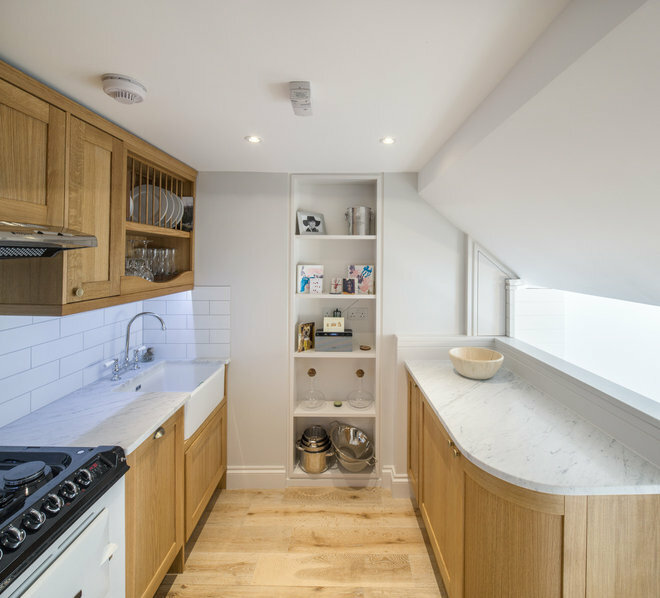 The biggest investment in this small kitchen was almost certainly the custom curved countertop, but the space created by this one design decision was surely worth it. 41. Extend an end. No room for a breakfast bar? Are you sure? 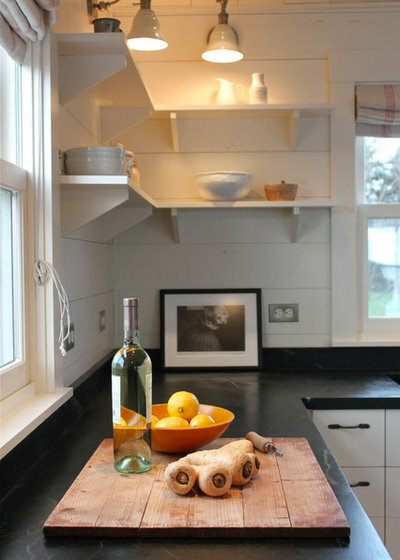 A simple countertop overhang has the potential to fit in the teeniest of spaces, providing a neat eating spot for two. 42. Boost your wall units. 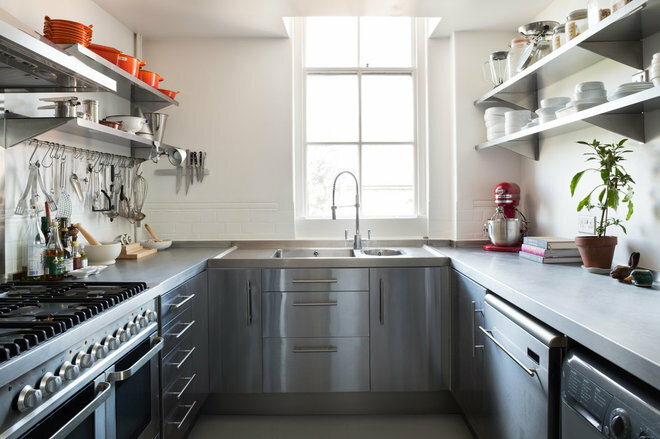 Depending on the type of range hood you have, there may be storage space — or simply dead space — above it. 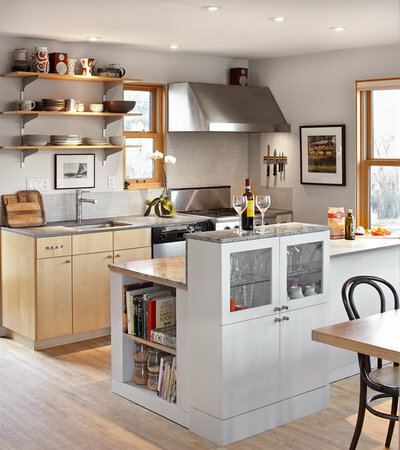 Here, the homeowners have added a built-in cabinet topped by open shelves for cookbooks just where you want them. 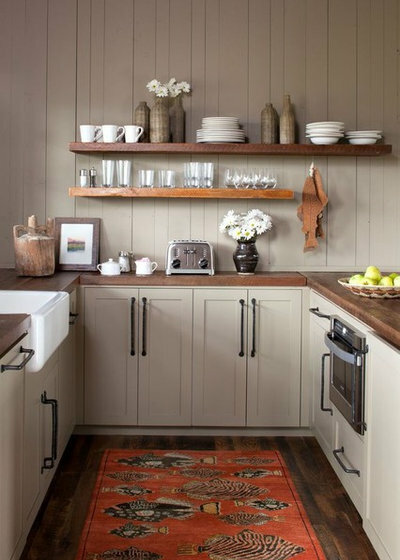 The neat shelves under the cabinets on either side, for condiments, spices and mugs, are a smart touch too. 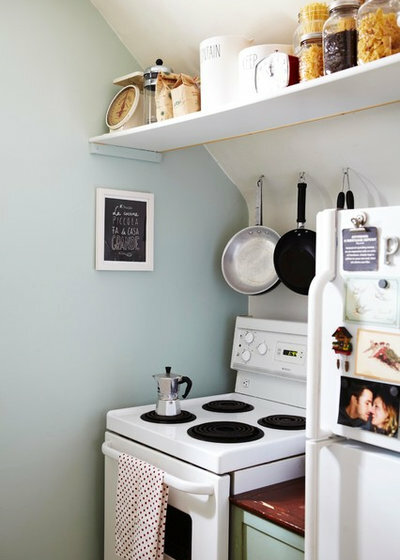 To create even more wall space in a small kitchen, extend storage right up to the ceiling. 43. Try two-layer drawers. Deep drawers aren’t always used to their full capacity. 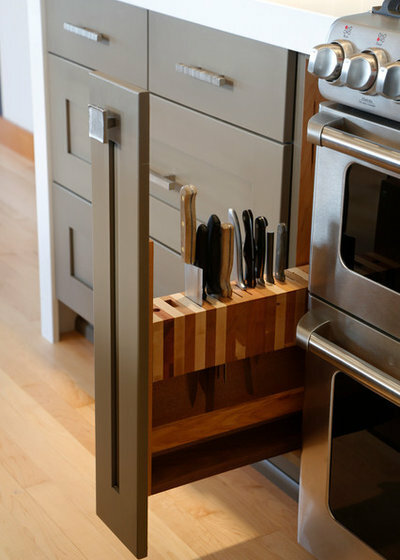 This nifty idea — a slide-across top layer for cutlery and smaller cooking utensils — makes sure no inch goes unused. 44. Add drawers to your breakfast bar. 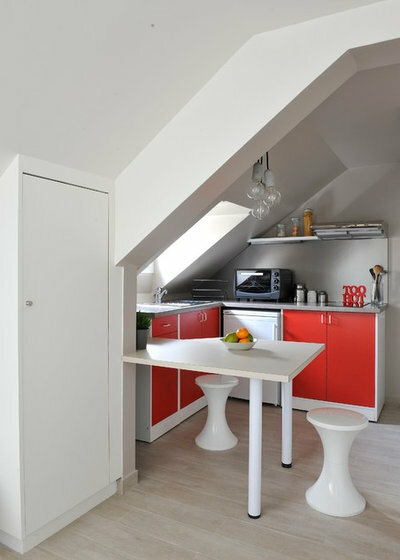 Boost the purpose of an eating or coffee-drinking nook by fitting drawers beneath it. 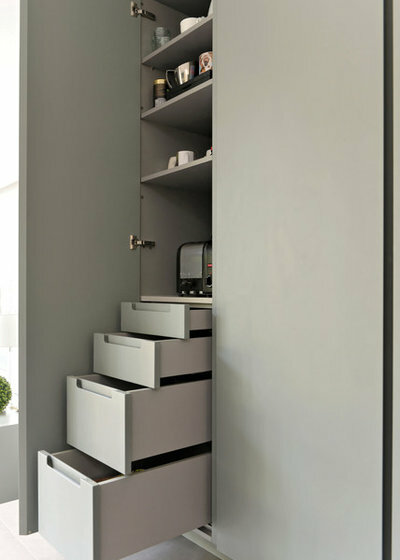 They’ll make a handy storage space for easy-to-reach cutlery, napkins, serving utensils and so on. Alternatively, if your nook doubles as a workspace, they’ll provide somewhere to tidy away a laptop and work paraphernalia at the end of the day. 45. Make your furniture foldable. Only have room for a table and chairs when you’re actually using them? Folding versions are a brilliant solution. Choose them in bright colors or nice wood tones, and they’ll double up as decorative accessories if you hang them on wall hooks when not in use. Garden furniture suits the purpose perfectly. It also can be much cheaper than indoor furniture. 46. Pop in a pullout desk. The simplicity of this micro desk is the secret of its design success. It’s essentially a chunky drawer-style design, but without the front or side panels. When the workday is done, simply push it in, with all your odds and ends in place, ready for tomorrow. If you prefer to keep everything out of sight, try the same idea, but with a hinged drawer front. It would need some ingenuity, so speak to an experienced woodworker for ideas and to get it built well, since it will need to be sturdy too. 47. Install a breakfast bar pantry. Here’s another spot for a pullout pantry (and wine rack). 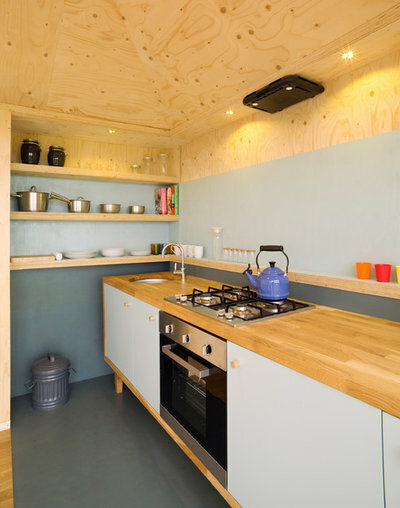 This tiny dining spot packs in plenty of functionality, with seating for four, as well as the storage. Don’t forget to position a couple of electrical outlets nearby, which will help make such a space even more versatile. 48. Elevate glass-fronted storage. This attractive, raised-height, built-in cabinet for glasses doubles as a shield for countertop debris — meaning the chef can conceal any mess from guests sitting on the other side. It’s also super handy to have glasses stored right next to the dining table. 49. Build around. Got an awkward pipe or architectural detail right where you want to put a cabinet? Don’t let it stop you. 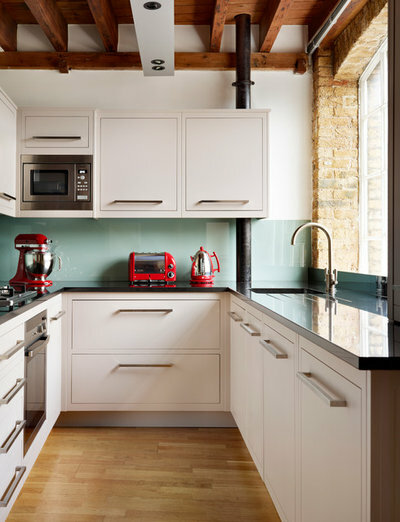 This kitchen simply incorporates the vertical pipe against its back wall, meaning no loss of wall units, simply the loss of the small area where the pipe sticks out. Looks good too. 50. Be canny with cabinets. What happens above your fridge-freezer? It’s easy to pile boxes, vases, once-used juicers and more on top of this kitchen appliance, but it can look messy. 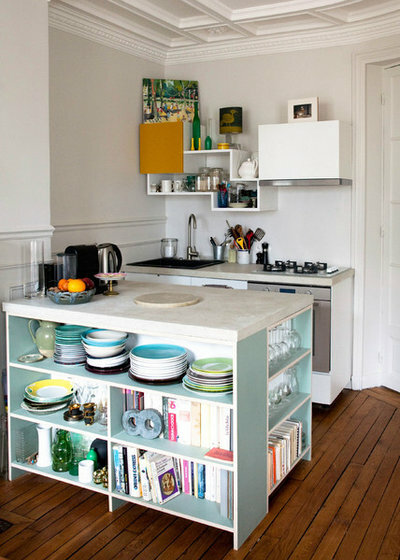 So why not formalize this storage spot (and tidy it up) by fitting a closed cabinet above it? Unless you’re very tall, a small set of kitchen steps will encourage you to use it too. 51. Create an optical illusion. The simple placement of a mirror next to a window can make a significant difference to any room, but especially a small one. This interesting, vintage glass has the added benefit of resembling a window in its own right (though you’d have to be comfortable looking at yourself while scrubbing the dishes). 52. Add a sleek, mirrored backsplash. Alternatively, a built-in mirror that doubles as a backsplash behind the cooktop almost creates a window in this modern kitchen. 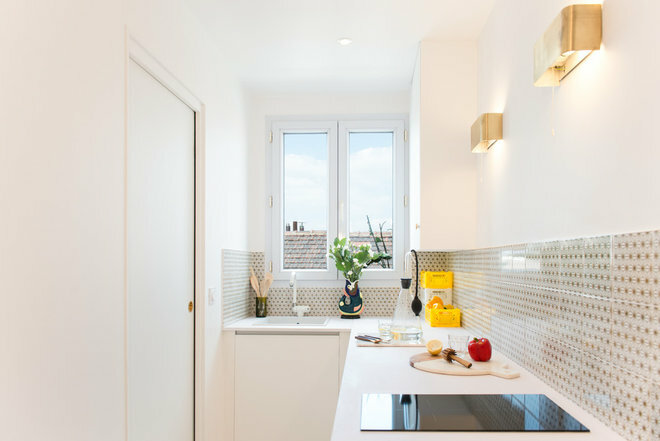 If you’re designing from scratch, and it’s feasible, aim to have a mirrored backsplash opposite a window to boost light and also to reflect some greenery or rooftops and sky into the kitchen. 53. Wrap it around. 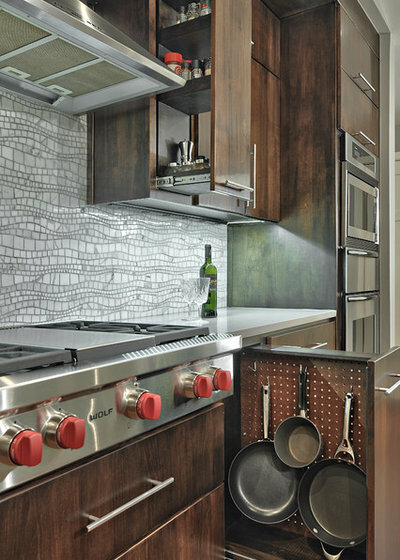 Done right, you can get even bolder with a mirrored backsplash. 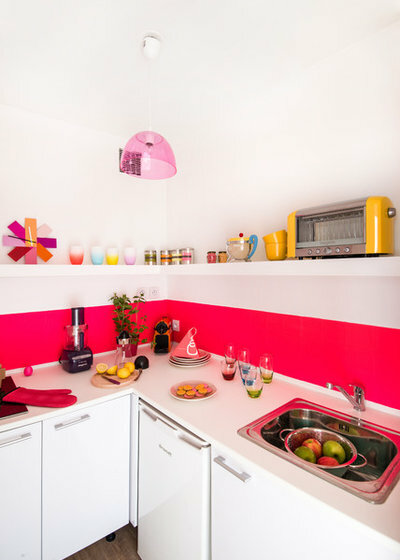 In this cute, sunny kitchen, the optical illusion is highly effective: The eye takes a while to realize the room is only half the size it initially appears to be. As a bonus, you get two windows for the price of one. No wonder the room feels so light and airy. Another idea to steal here is the wood detailing. See how the grain follows through, creating a flowing, streamlined effect? Careful matching in this way has further stretched the space visually. 54. Mix modern and antique. If you don’t want, or can’t fit in, a vintage framed mirror, choosing antiqued glass for a mirrored backsplash instead can add interest and soften an ultramodern scheme, as seen here. Check out, too, that nifty built-on dining table. It’s a nice alternative to the classic breakfast bar. 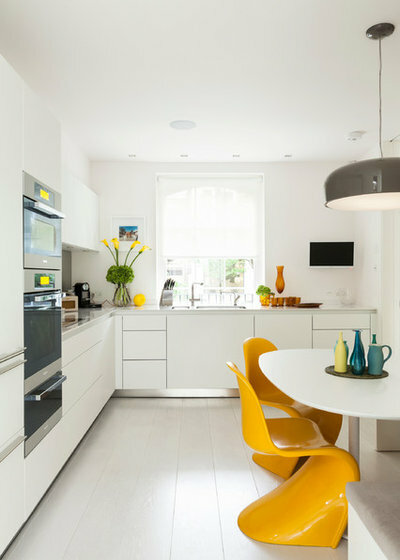 What could have been a slim extension has been cleverly enlarged with a curved oval tabletop, which maxes out eating space without taking up floor space in this compact kitchen-dining area. 55. Take it to the top. 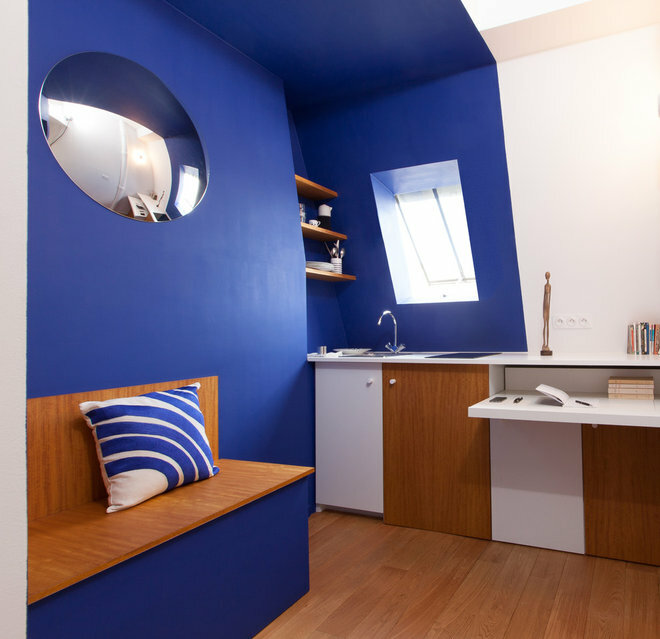 Another way to create the illusion of more space is to fit a mirror right up to the ceiling. Here, the visually confusing effect is boosted by the addition of open shelves, which appear to float in midair. Note how the homeowners have stored only glass or reflective items on these surfaces, which maximizes the effect. 56. Add an internal window. 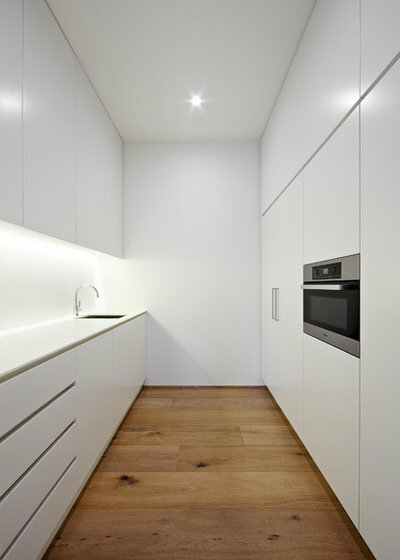 If your small kitchen is also windowless, could you add an internal window to “borrow” light from a neighboring room? Here, the glass also doubles handily as a backsplash, meaning it takes up no extra valuable wall space. 57. Install a window on the world. Here’s another glass backsplash, but in this design the window looks out on the world. 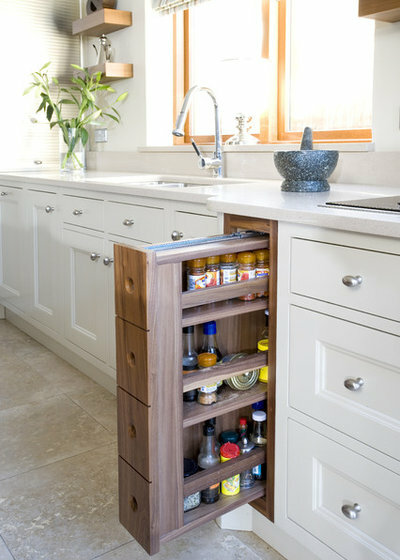 This is an option that could be especially worth exploring if your dinky kitchen is part of a new addition. The multipurpose function of your window could bag you some valuable extra vertical space for additional wall units or shelving. 58. Shelve every spare inch. 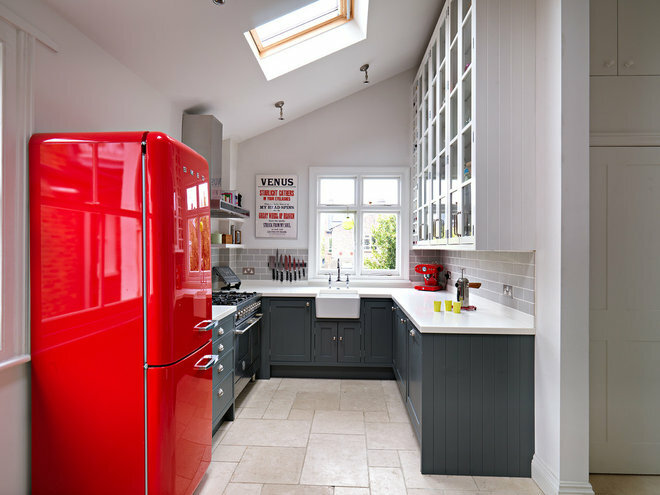 The awkward shapes thrown up by the slim, side-of-the-fridge spot and sloping ceilings here haven’t been wasted, and pack in useful storage. Design your shelves around the objects you need to store on them to maximize their usefulness. Also, paint them either the same color as the walls or your units, so they don’t intrude visually into your little space. 59. Have holes instead of handles. 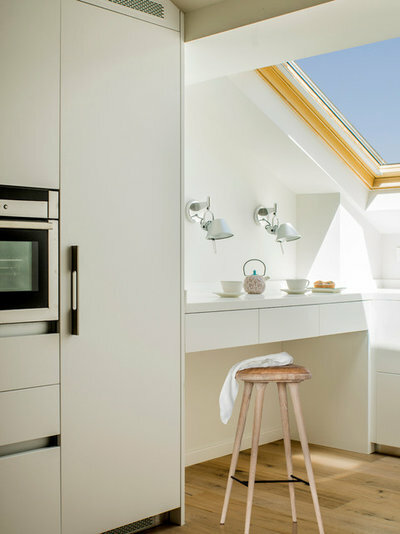 Even a design detail as small as protruding handles can impinge on the sense of space in your kitchen. Going handleless doesn’t have to require push-open devices or ready-made doors — well-made holes will work perfectly. Buy your kitchen cabinet boxes and have a skillful cabinetmaker construct the doors for you — you could even go for affordable MDF with grooves cut into it to create this tongue-and-groove effect. Then, instead of fitting handles, ask the cabinetmaker to cut finger holes into each door or drawer front. Bear in mind that an integrated dishwasher in a kitchen like this could be tricky. 60. Or go ready-made handleless. 61. Aim high. 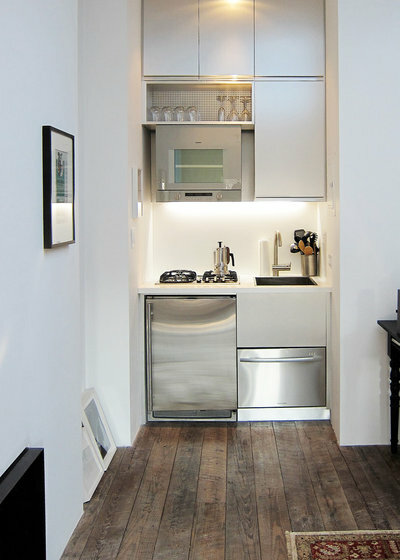 Floor-to-ceiling cupboards maximize storage in a small kitchen. They can also help a room look taller. Because they’re trickier to access, the top cabinets are most useful for things you don’t need every day, or even household files if you’re in a super-dinky spot. If this is the case, you could consider having very narrow shelves inside the cabinets, creating slim pigeonholes for your paperwork. 62. Install above-door shelving. The space above a door can be a great spot for bonus storage. Here, the homeowners are lucky enough to have a deep wall in which to bury a niche, making this shelf flush to the wall. Even if you don’t have thick walls, a shelf or two, or even a small custom cabinet, can do a similar job. 63. Or take shelves right around. This version not only extends around the sides, but also shows the idea as protruding shelves rather than as a niche. 64. Adapt your countertop. 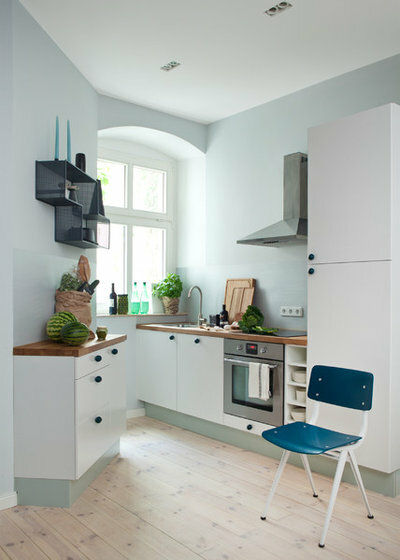 If you don’t have space for a mini countertop extension to create an eating perch, could you do away with base units under a section wide enough for a couple of chairs? 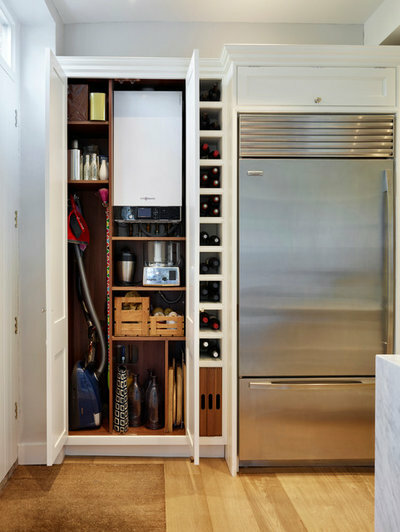 A full wall of storage elsewhere in the kitchen, as here, is a potential solution for maintaining sufficient storage. Again, extending storage right to the ceiling will claw back additional cabinet or shelf space. 65. Abandon wall units. 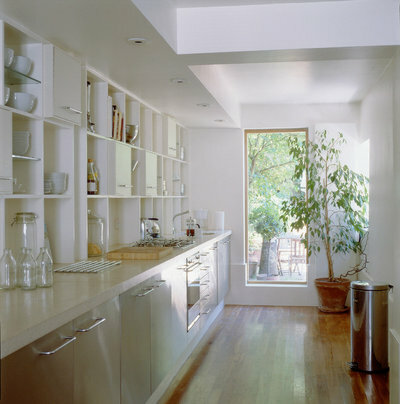 Keep a compact, U-shaped kitchen from feeling claustrophobic by choosing airy, open shelving instead of solid wall units. The trick to making it work? Color coordination. 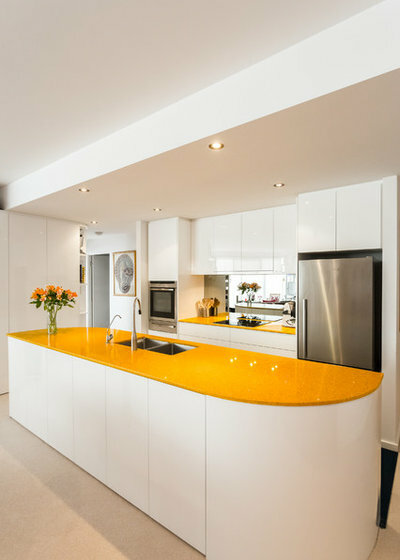 Even if you have pots and dishes in many different hues (unlike the tonally ordered arrangement in this space), you can arrange your things by grouping similar colors together, and even going for an ombré effect by arranging them to create a gradient effect — browns next to oranges next to yellows and so on. 66. Vote for soothing neutrals. A muted palette can create a luxe hotel look. While this may not meaningfully max out your available space, it will feel calm and sophisticated, rather than cramped and cluttered. 67. Section your drawers. Many of us have already embraced the smart idea of stashing dishes in drawers rather than cabinets, where items at the back can languish, unloved and rarely used. 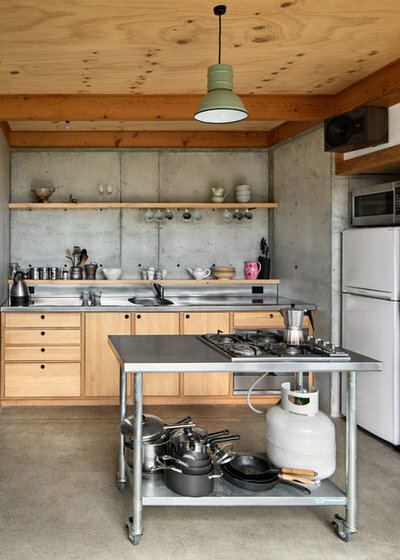 But the kitchen drawer in this space takes the idea a step further: A pegboard-like base allows for movable dish “posts” to keep everything in its place, making more of the available space. 68. Make your oven do double duty. 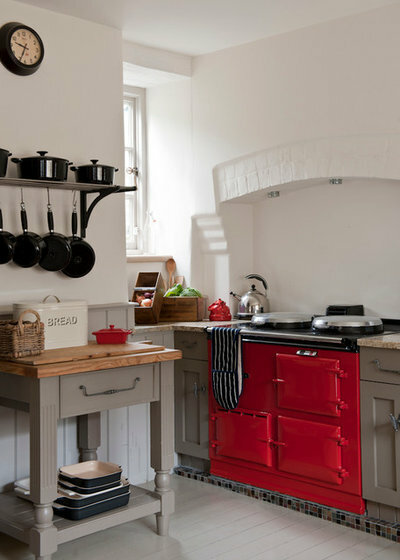 In a dinky kitchen, your choice of oven could have a significant impact on saving space. 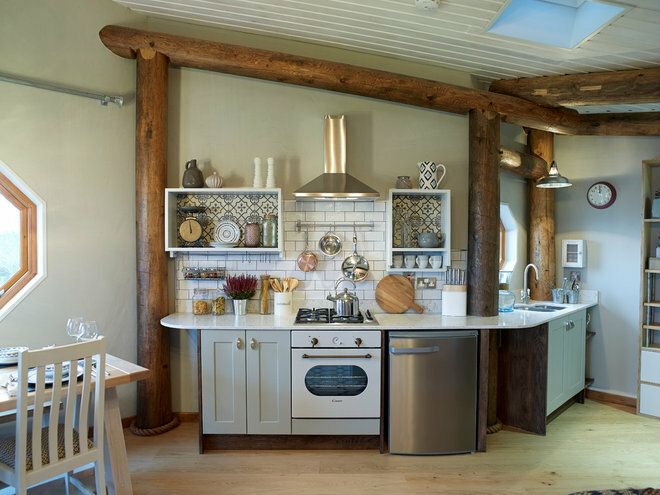 Where there’s no room for a microwave and an oven, consider a combination microwave oven with grill that will do everything — something like the model shown in this rustic-industrial kitchen. 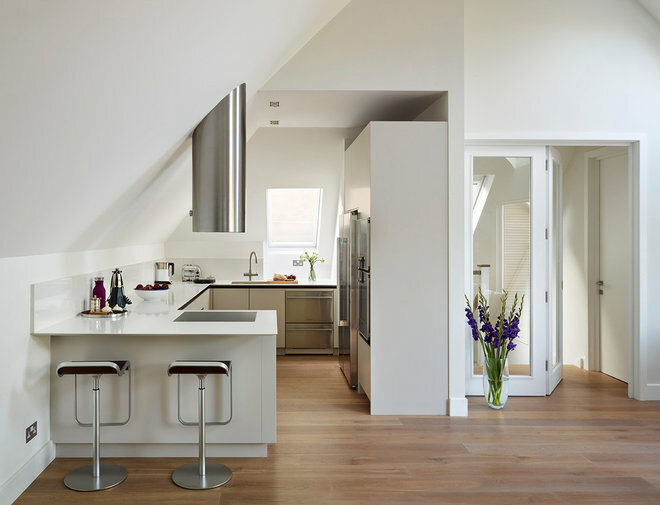 If the kitchen’s about to be built, go for an integrated model to give more of a streamlined effect. If you’re adapting an existing kitchen, and pulling out the oven to make more cabinet space, you could mount a non-built-in model on a wall shelf. 69. Corral your cooktop. Because induction cooktops are flat and almost flush to the worktop, they can double as an extra work surface when not in use. Simply cover with a chopping board. 70. Hide everything. Go uber-minimal, with everything concealed behind closed doors and drawers. 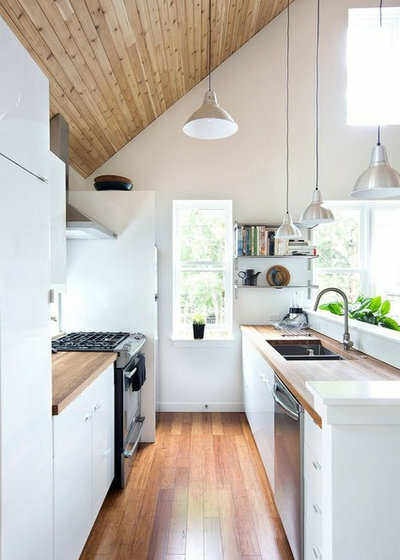 This all-white, clutter-free kitchen may not be for everyone, but it certainly packs in the storage without crowding the space. 71. 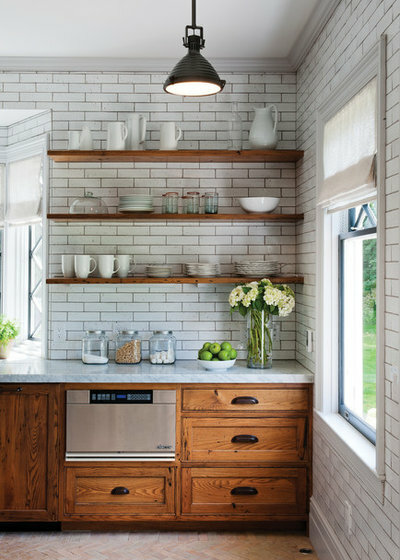 Cook up a backsplash-height shelf. 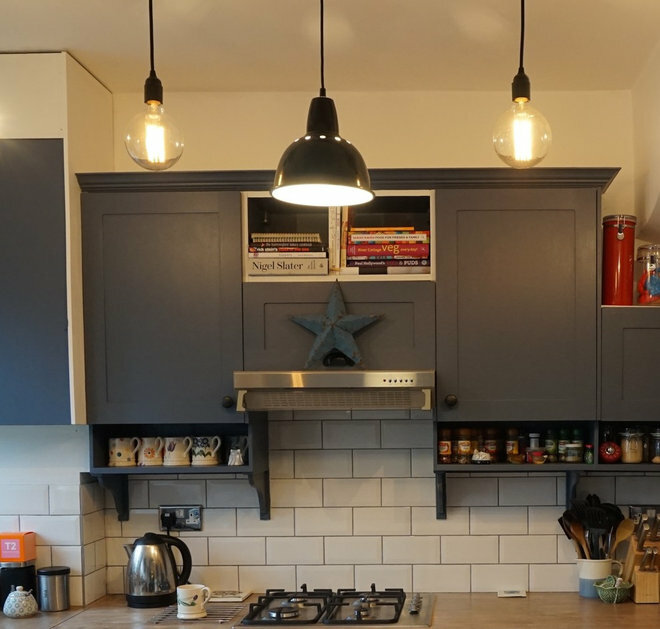 This hand-built Scottish kitchen gains useful space by the super-simple addition of a wall-width shelf across the top of the low backsplash. It’s the perfect height for storing frequently used herbs and spices (and these would look especially good decanted into matching little containers). Equally, mugs and glasses could be kept handily close to both coffee maker and faucet. In addition, the shelves on the end wall are only as wide as they need to be. Breaking slightly with convention, the bottom one overhangs the countertop a little, yet it isn’t in the way. 72. Let your countertop spill over. The obvious thing would be to end this countertop where the wall stops, to the right of the sink. But why be conventional when you could, instead, create more space. 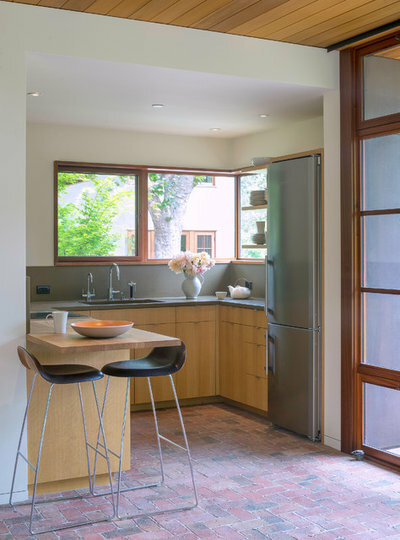 Elsewhere, this “countertop overhang” idea has been used to house a tiny breakfast bar, but here, with the steps down to the kitchen area in the way of any potential seating, this space simply expands the usable work surface. 73. Build around your water heater. Hot water heaters are generally bulky, awkward and never where you’d like them to be. But don’t let yours thwart you. Use it as the starting point for a super-practical custom utility cabinet, with little nooks for everything you need to stash in it. Try laying out all that needs to be stored and design the shelving around it, rather than vice versa, to max the space. 74. Consider a cutaway breakfast bar. 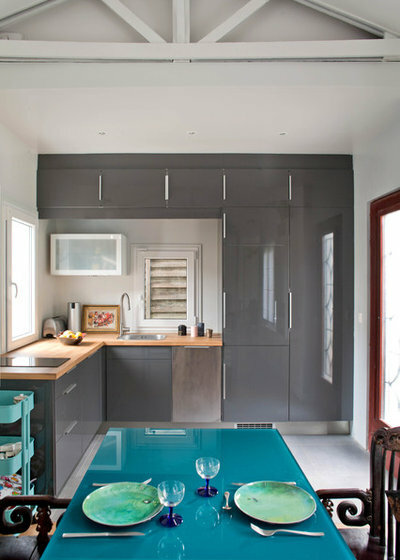 If a rectangular table simply won’t fit (or won’t let you open your cupboards), don’t feel disheartened. 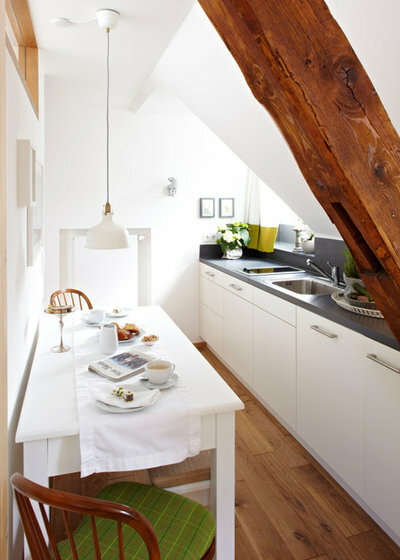 Instead, think whether you could modify your table, or create a makeshift breakfast bar, as seen here, so it will. Check out the classic Tam Tam storage stools too — perfect for keeping not-in-use tea towels inside. 75. Add a micro countertop. This vintage-style country table is teeny, but it provides a sliver of extra workspace. A table like this could also make a good coffee and toast spot in a kitchen where there isn’t quite enough counter space. 76. Exploit corner shelves. If you need some depth to store larger items on your shelves, but don’t have the space, consider tucking them into a corner. 77. 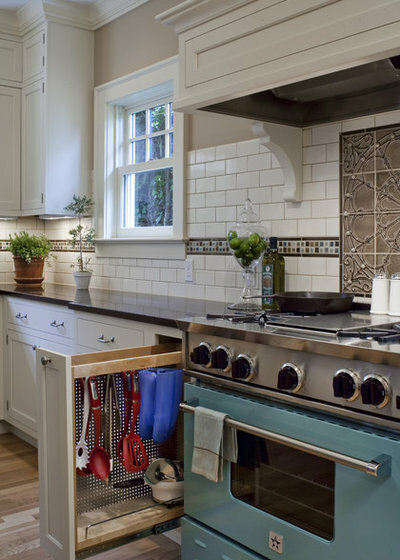 Design a wraparound backsplash. To give the impression of a more elongated space, aim for long, unbroken lines, and be careful where you position blocks of color. Work to create a design that encourages the eye to keep moving, which will enhance a sense of flow. 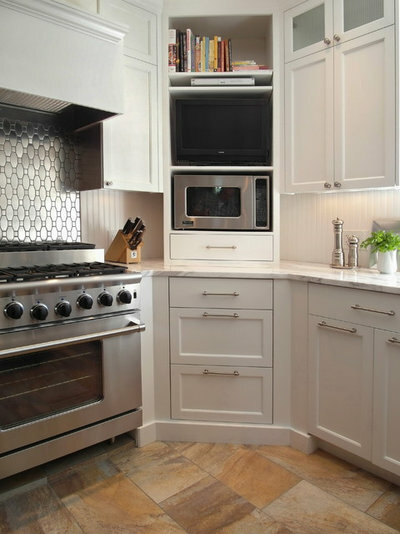 This continuous tiled backsplash does that job simply and effectively. 78. Be strategic with color. 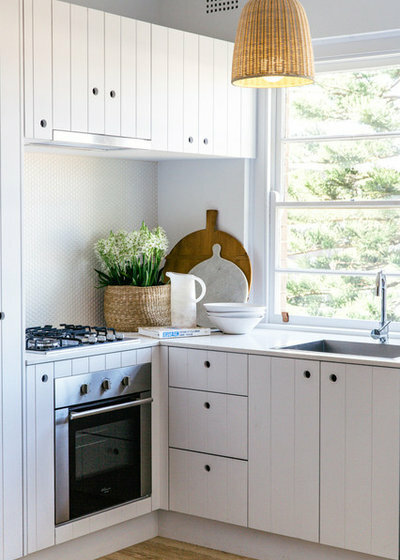 All white is a pretty foolproof scheme to keep a small kitchen feeling light and open. However, color might make you happy. So don’t avoid it, but be aware that too many colors, used with abandon, could shrink your space. The best advice is to use color strategically. You could, for example, add flashes of neon, whether in a streak of paint or colored glass, or simply in your accessories and appliances. 79. Decorate with tones of one color. 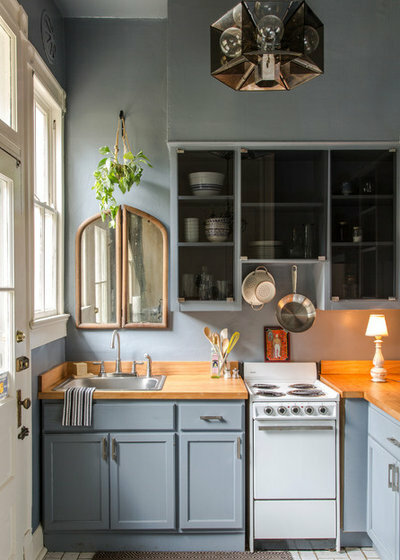 Keeping to one hue in your small kitchen will help maintain an aesthetic that oozes control and calm. Here, different shades of blue on the units create a soothing gradient effect, while a white backdrop — and minimal accessorizing — keeps the room from looking color-cluttered and potentially smaller as a result. The spike of neon yellow is so small it doesn’t impinge on the space. 80. Tap into off-white. To maintain that airy, bigger-space feeling without going for brilliant white on the walls, simply choose the perfect almost-white. 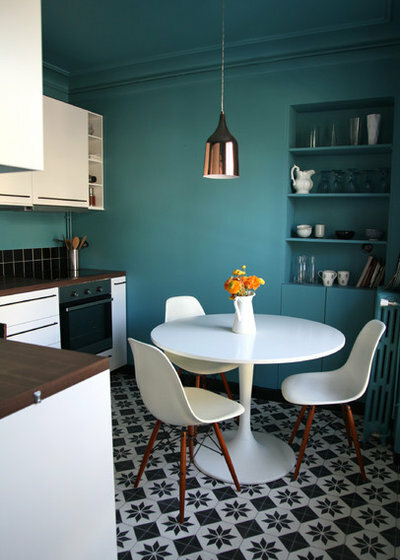 A hint of cool blue-green, as seen here, will generally create a more relaxed mood than a warmer shade. 81. Don’t try to cram it all in. If you have a small cook space, chances are you’re not going to fit every bit of storage or appliance into the general kitchen zone. 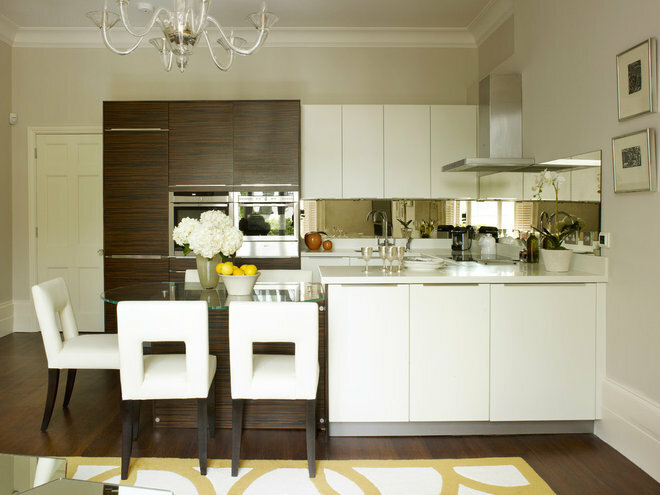 If you have an open-plan space, don’t be afraid to let a cabinet or set of kitchen cabinets spill around a corner. 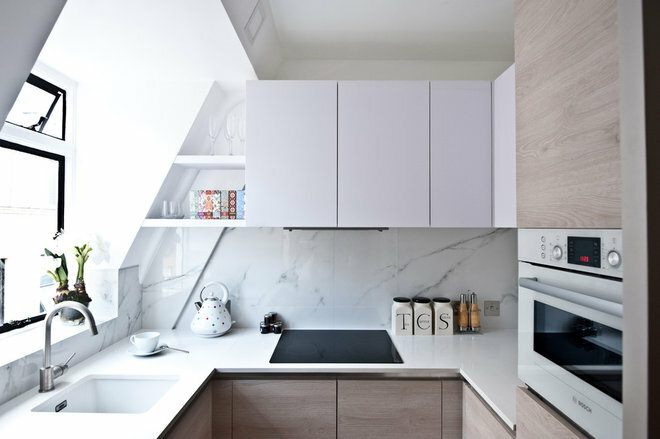 Here, the owners have chosen to connect the around-the-corner cabinets to the kitchen by having them in the same finish. However, if you want to build more of a living room feel outside the confines of the cook space, consider an antique French dresser, open shelves that mix storage with framed pictures or pieces of art, or a closed cabinet painted the same shade as the walls to “hide” it. 82. Make use of odd-sized gaps. 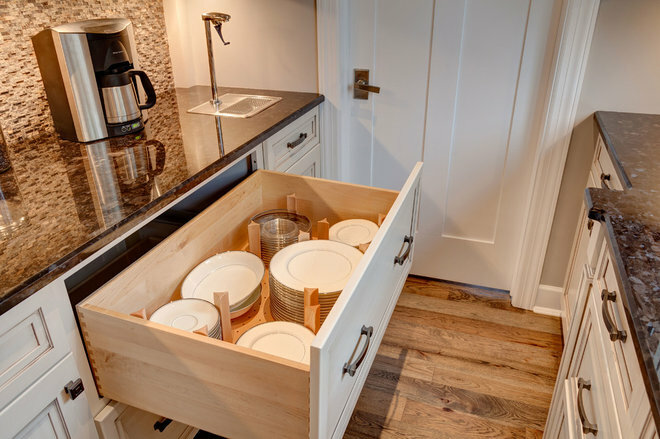 Standard base cabinets have fixed measurements, so unless you’re going custom, you may find you have an odd-sized gap you’re not too sure how to fill, but need to use. These slide-out baskets are one solution. If you have a smaller space, you might consider mini wine shelves or micro drawers just big enough for a set of spoons in one, forks in another, napkins in another and so on. You could even DIY these, if you have the shelves in place, by using dinky-sized storage boxes without lids that you can pull in and out. 83. 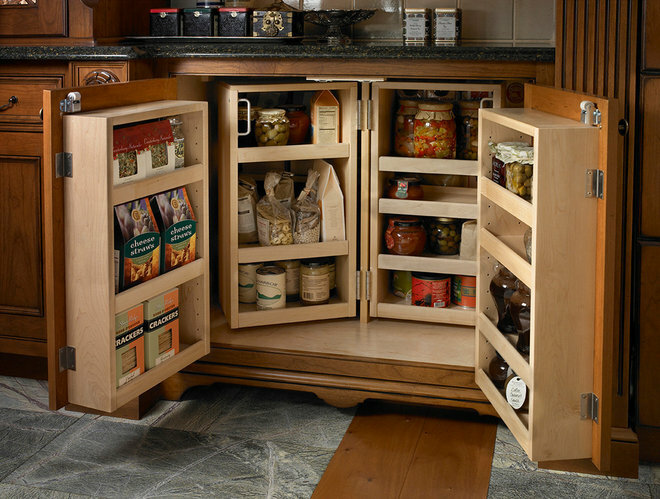 Pop in a half-height pullout pantry. Alternatively, you might have the optimum size gap for one of these — perfect for spices and cooking condiments next to the oven. 84. Customize your shelves. Keeping clutter off your countertop and maxing cabinet and drawer space are two things you’ll probably want to do in a petite kitchen. 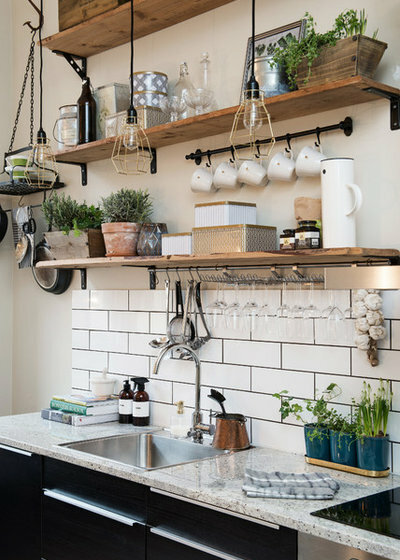 One excellent way to do both is to make your shelves work harder by hanging things under them, something this cool Scandinavian kitchen does particularly well. Also look out for baskets and utensil pots you can hang, or undershelf shelves that hook onto the fronts of your existing shelves. 85. Layer your rails. Why stop at one hanging rail when you can have three? That’s an entire cabinet you’ve just freed up. 86. 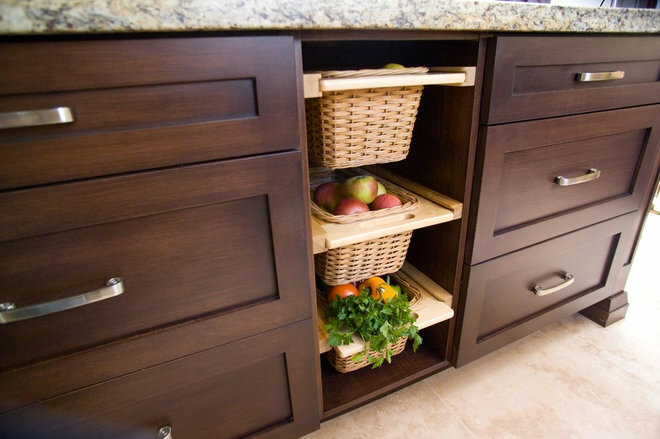 Expand corner cabinet space. Could you pack more into your cabinets? This pullout rack system fits plenty into a corner unit and makes it all easy to access. Also, make use of the backs of doors for hooks and lid racks. Get inventive with self-adhesive hooks and wire baskets to hang from them — or stash magnetic spice pots on the backs of doors, sides of units or under shelves. Check out racks and stands that create mini shelves inside your cabinets. Flirt with undersink storage organizers. Think creatively! 87. Max out your base cabinets. 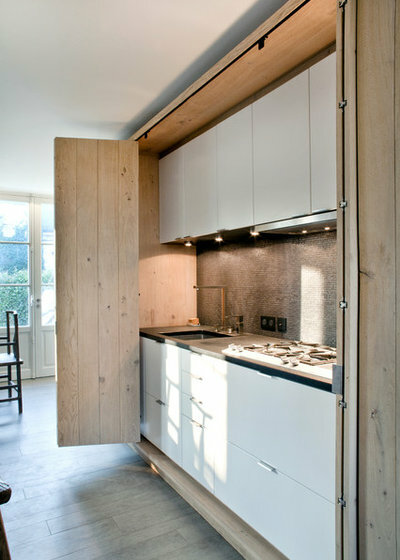 In the same vein, how clever is this idea for making more of a double cabinet? 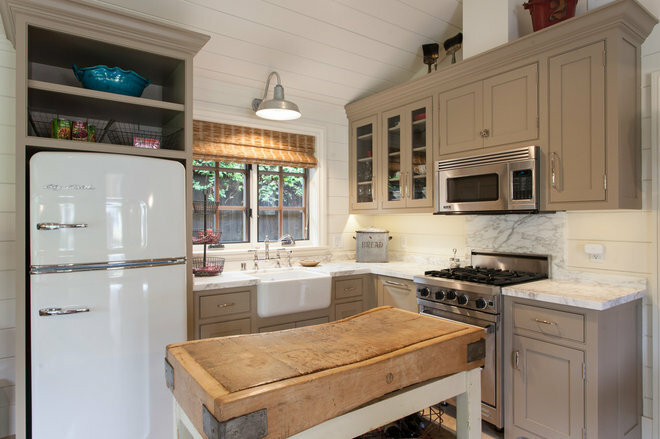 Get acquainted with a savvy cabinetmaker and see what you can create. 88. Stretch up high. A shelf close to the ceiling is another excellent space booster, and one often overlooked. 89. Don’t be afraid of black. 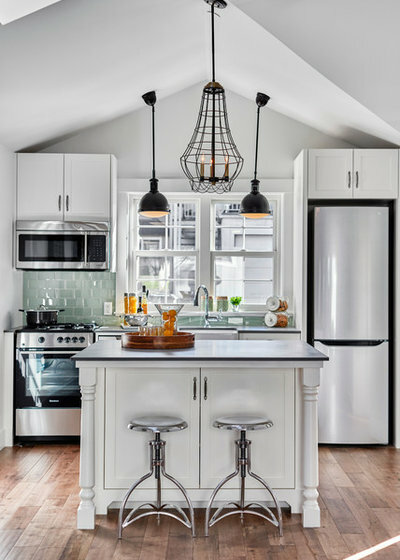 White is an obvious color to make your space look larger, but a crisp monochrome scheme can add interest to your kitchen too. Keep cabinets white and walls dark. That way, you’ll visually create depth, as the black areas will appear to recede. 90. Share your shelves. 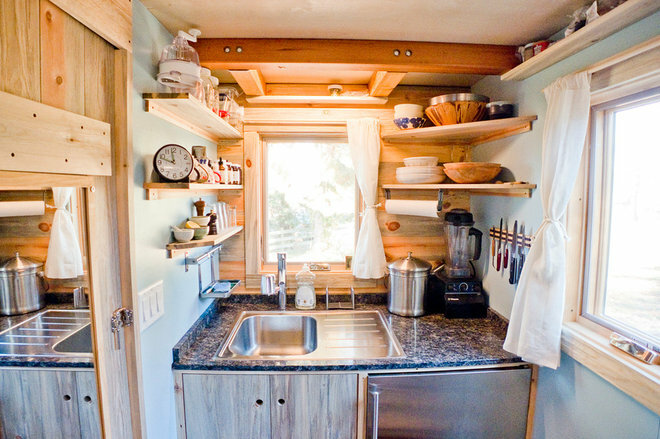 Maybe it’s not just your kitchen that’s small, but your whole home. 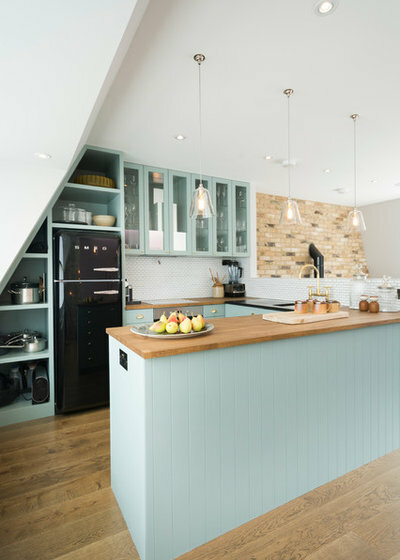 While open-plan is on many of our wish lists, it’s not always the most practical for small-space living, where walls equal storage opportunities. 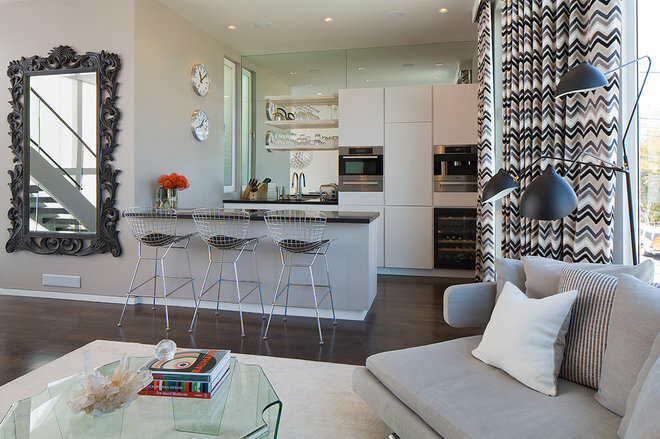 Here, an element of open-plan is introduced, yet the wall space on the left is not lost, as a book-filled divider plugs the gap. 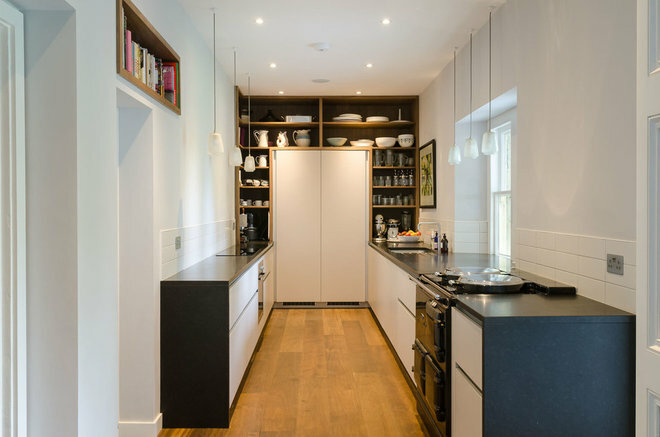 This flexible solution allows the space to be used for storing living room tomes and cookbooks alike, as well as decorative kitchen objects that will look good from both sides of the divide. 91. Big up a window. Consider enlarging a window in your kitchen. Here, though this one-wall design is in a narrow room, the light and focal point provided by the floor-to-ceiling glass really opens up the space. 92. Stash your servingware on the outside. 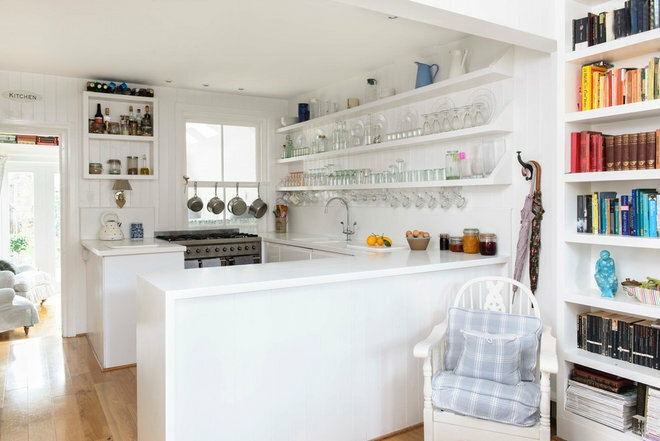 In a large kitchen, there’s often plenty of space for glasses, cutlery, napkins, jugs and pretty serving dishes. In a smaller space, not always. Consider keeping these items not required for the business of cooking either on the outside of your work area in an open-plan room, or even in a cabinet or drawers separate from the kitchen and close to where you eat. 93. Reveal and conceal. 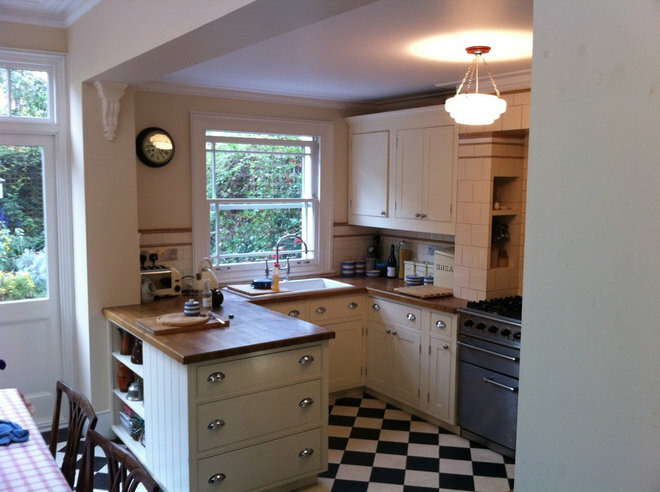 As already mentioned, the less clutter showing in a small kitchen, the more spacious it can feel. 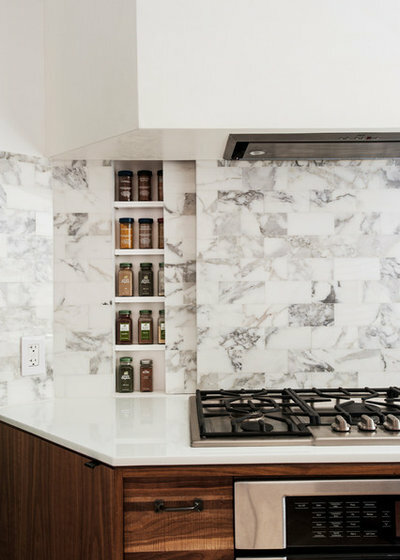 So how about this for the ultimate in luxe-look custom storage: a backsplash that slides across to conceal shallow shelving. 94. Beef up your corners. The convention with corners is to use clever pullout cabinets designed to fill the space. But sometimes you need a corner to give you room for things that won’t fit around that kind of arrangement. Instead, create a flat wall across the space, as shown here. 95. Tailor your drawers. 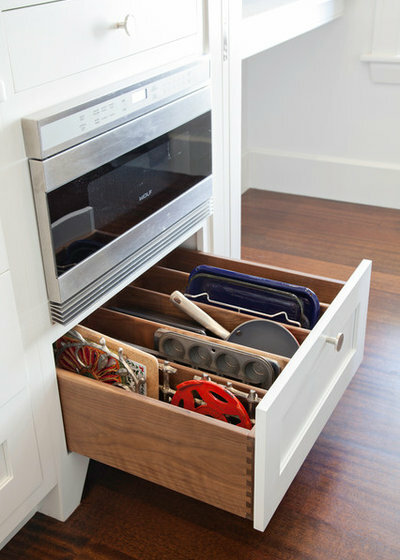 Here’s another idea for making the most of drawer capacity — perfect under-the-oven practicality. 96. Slide and hang utensils. 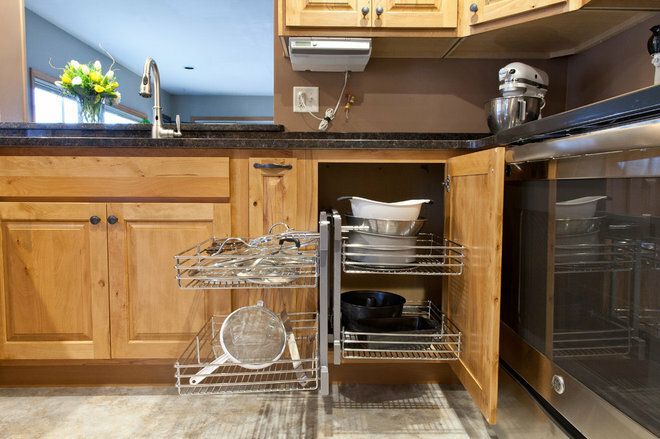 Keep utensils off your countertop by storing them next to your oven instead. A slide-out rack like this is also the perfect place to stash bulky oven gloves for easy access. 98. … or a pullout knife block. 99. Create zones. 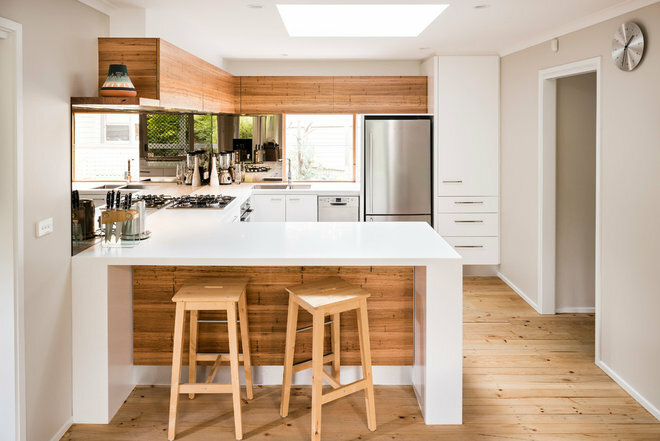 Draw the eye away from the cooking area to visually trick the brain into registering two distinct zones — and, subconsciously, a larger kitchen as a result. 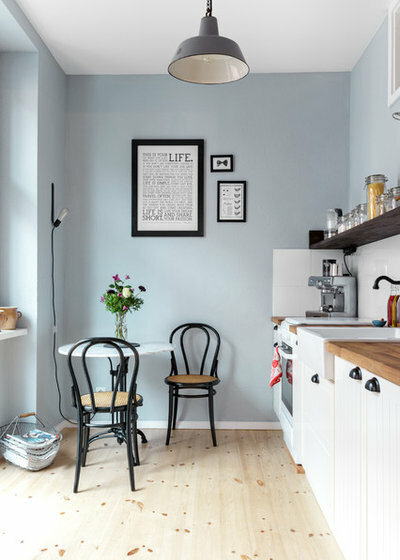 This is possible even in a narrow kitchen, as seen here, where the homeowners have made an attractive dining area with striking black bentwood chairs.